This product forms part of the following series: Albert edition(496). 1. Pluto -- 2. Mars -- 3. The sun -- 4. Mercury -- 5. Pulsar -- 6. Spiral galaxy -- 7. Earth -- 8. Sombrero nebula -- 9. Phoebe -- 10. Fiji moon -- 11. Stefan's quintet -- 12. Quasar Pks 2142-75 -- 13. Star clusters -- 14. Saturn. Includes brief programme and performance note. 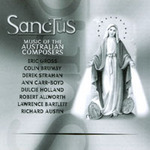 CD: Sanctus : music of the Australian composers. 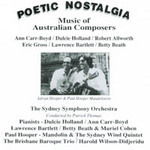 CD: Poetic nostalgia : music of Australian composers. 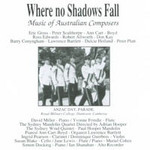 CD: Where no shadows fall : music of Australian composers. CD: Masques / [music of Colin Brumby & other Australian composers].